Most people who have been on a trip to Disneyland often think of it fondly as a place where they could let loose and just be happy. Few people doubt Disneyland’s claim to being the “happiest place on earth.” What not everyone knows is that during the Christmas season, Disneyland gets a head-to-toe makeover and it becomes not only the happiest, but the merriest place on earth. Christmas at Disneyland is one of my favorite seasons. The added decorations in the park alone leave you immersed in a festive holiday wonderland. However, there are some additions to the park during the Holiday season that are wonderful bonuses to an already magical place. As with anytime of year though, if you don’t know what you are getting yourself into at Disneyland, you may miss out on some of the magic and festivities that are just waiting for you to discover. Below you will find some of the “extras” that can add a little bit more sparkle to your Disneyland vacation during the Christmas season. Read closely. You won’t want to miss a thing! Hidden back behind Big Thunder Mountain resides one of the merriest places in the whole park – the Jingle Jangle Jamboree. This is one of my family’s favorite places to visit during the holidays. Here you’ll find your favorite Disney characters all dressed up in their Christmas outfits, special entertainment, reindeer games & activities, merchandise, treats, and of course meet the big guy himself, Santa Claus. While enjoying the live entertainment families can make their own holiday decorations at the craft station or try some of the reindeer games. My favorite reindeer game is the ‘Dashing Thru the Snow on a Slippery Slope’, its much like Plinko but instead of getting points at the bottom you race against others and whomever gets their puck to the bottom first wins. Each year, for both the Halloween and Christmas Seasons the Haunted Mansion is transformed to the theme of Tim Burton’s ‘Nightmare Before Christmas.’ This transformation makes the Haunted Mansion one of the most popular attractions in the park during the holidays. It is definitely on the top of my list of must-sees each year. Notice the ginger bread house in the main ballroom of the attraction. 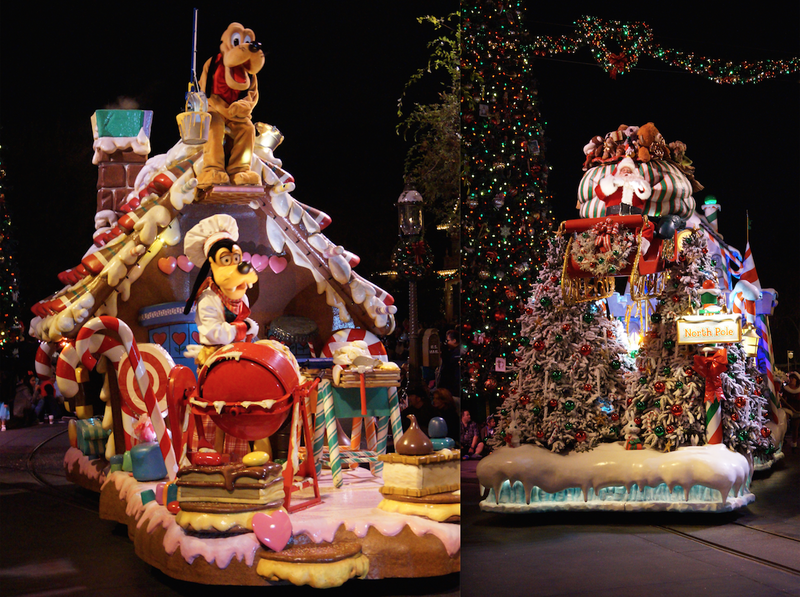 The bakers at the Disneyland Resort come together each year to create an original gingerbread house. Last year’s gingerbread house was perched on a tall and spindly mountain featuring a flying Zero and a ghost train. At 9 feet tall, it was one of the tallest they’ve ever built. The well-known attraction, the Jungle Cruise, gets a transformation this season with holiday gifts and décor. The skippers are as witty and funny as ever but with a holiday twist this time. 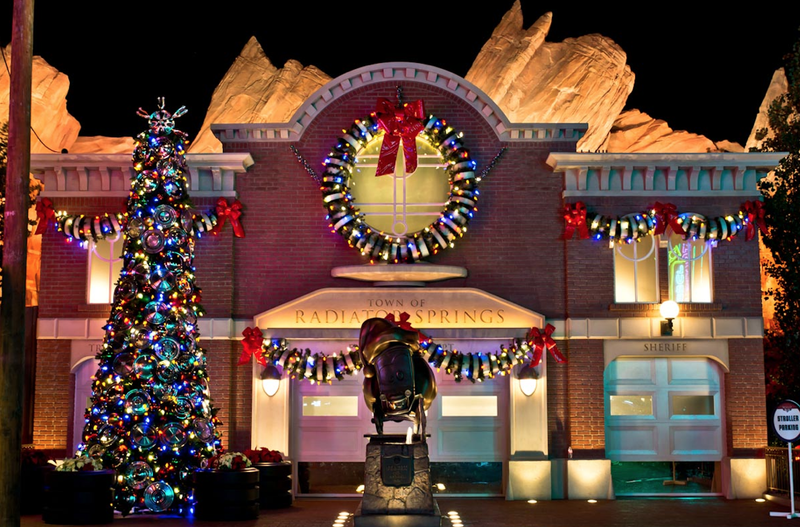 Having the holidays intertwined with this attraction brings even more life and excitement to one of our favorite classics. You have to go on it several times to see all the added extras. I’ve ridden it several times now and still don’t think I’ve seen all the little touches. It’s a holiday don’t miss! 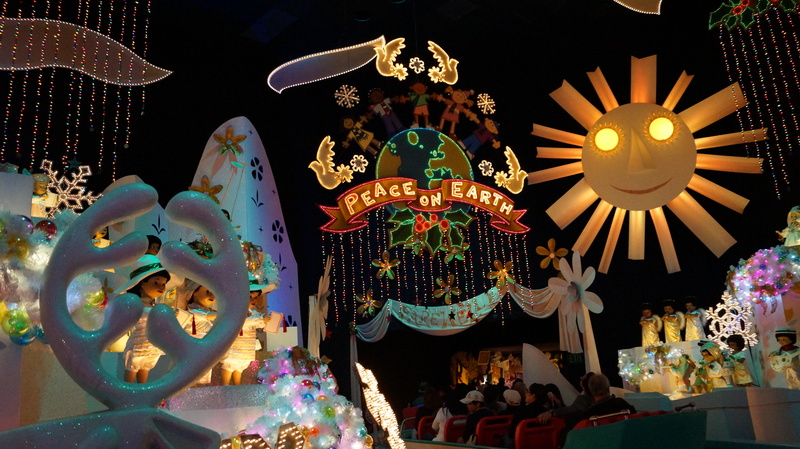 it’s a small world – The Happiest Cruise that ever sailed just got Merrier! One of the biggest icons of the Disneyland Park is transformed into one of the happiest attractions ever created. They have done this by the explosion of decorations in and around every inch of this attraction. Additionally, they have created a medley of songs using Christmas carols from around the world. We usually only ride this attraction once each visit but with things made up for the holidays, we find ourselves riding in several times. There is just so much to see and enjoy. One of the things we like to do while riding the attraction is to find all the Disney characters mixed within the 300 plus dolls. Can you find them all? The characters you will find are Peter Pan, Tinker Bell, Cinderella, Pinocchio, Jiminy Cricket, Aladdin, Jasmine, The Three Caballeros, Ariel, Flounder, Lilo, Stitch, Woody, Jessies and Bullseye. Ending the day watching one of the merriest fireworks show on the planet is particularly fun and special. With the incredible Sleeping Beauty’s Castle covered in 80,000 twinkling lights, snow, and icicles in the foreground, there really is no better setting for a firework show. Watching the fireworks choreographed to traditional Christmas music really brings the holidays to life. To top it off it snows! That’s right it snows along Main Street all the way to the castle. Yeah, Disney knows how to celebrate the holidays! For the fireworks, I would stand between the Refreshment Corner on Main Street and the main hub in front of the castle. I would not stand between the hub and the castle because you’re so close you will not be able to see the fireworks as well. On top of the Train Station behind the preferred seating, is another great place to view the fireworks. Those siting in the seats are required to stay seated. You will get an amazing panoramic view of the fireworks. Make sure you arrive early for a spot. 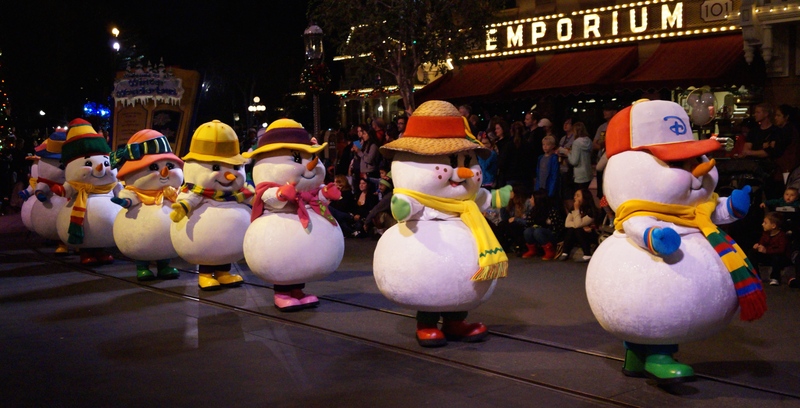 Disneyland’s Christmas parade is so much fun to watch and really gets the whole family into the spirit of Christmas. I love how Disney has been able to create a parade with so much tradition and memories of the holidays we have all come to love. You get so much more than just seeing your favorite Disney characters but are surrounded by prancing Reindeer, dancing ginger bread man, houses made out of gingerbread, marching toy soldiers, dancing snowman, Christmas trees and to end it all, Santa Claus. 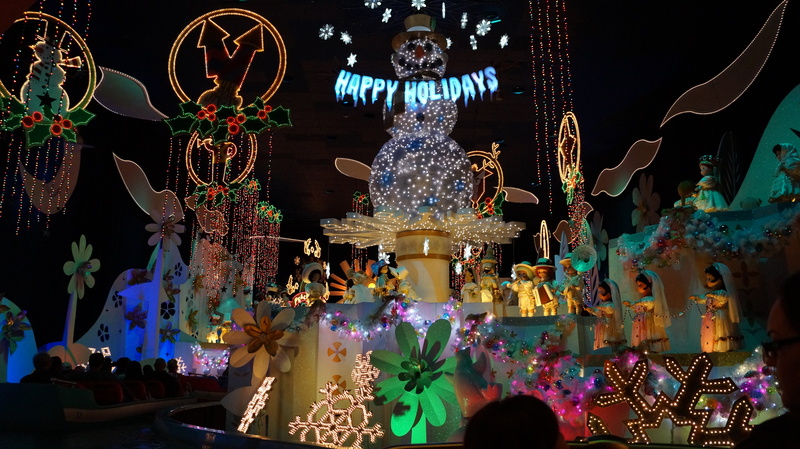 This magical parade runs twice a day during the holiday season. If time allows, it is kind of fun to watch it during the day and at night to get a different perspective. There are always less people at the second parade. If the weather is looking bad, choose the first parade in case the second one is canceled. Avoid Main Street and the main area in front of the Castle! The crowds are the biggest around these areas. Start finding a place to view the parade about 45 minutes before it starts. While you save a spot, this is a good time to eat. Have part of the family stay and hold the viewing spot, while the others go and get food or snacks for everyone. Join your favorite three amigos, Donald Duck, Panchito from Mexico and Jose from Brazil in their high-spirited celebration street party. This party focuses on Latin American traditional songs, dancing, and the larger than life 12-foot-tall mojiganga puppets of Santa and Mrs. Claus. Of Course, no Disney celebration is complete without Mickey and Minnie Mouse in attendance. You will definitely find yourself dancing and singing along with everyone. This fun celebration takes place daily several times throughout the holiday season. Between these celebrations you can actually meet the three amigos along with Mickey, Minnie and Goofy all dressed in their Latin Christmas outfits. Check the daily times guide for specifics. Cars Land is probably the most decorated area in any of the parks between both Walt Disney World and Disneyland. It doesn’t matter where you turn there are creative and fun decorations everywhere. My favorite thing to do in Cars Land during the Holidays is find all the creative trees put up around the area. I think my favorite tree is Sally’s Construction Cone Tree with Lizzie’s Route 66 Signs tree in a close second. All the trees are pretty amazing so make sure you take the time to look through the pictures below and decide which one is your favorite. If you will be in the parks this holiday season, I would also recommend making sure to go back and explore Cars Land at night because it is a totally different experience with all the neon lights turned on. For those not visiting the parks this season, take a look at the pictures below and enjoy! Merry Christmas and Happy Holidays. One of my favorite nighttime shows World of Color is transformed into an amazing wintry wonderland celebration know as Winter Dreams and is hosted by everyone’s favorite snowman, Olaf! With the mists of water, lazars, HD projections, fountains and a mixture of your favorite Christmas songs this is one of the top things for my family to see during the holiday season. 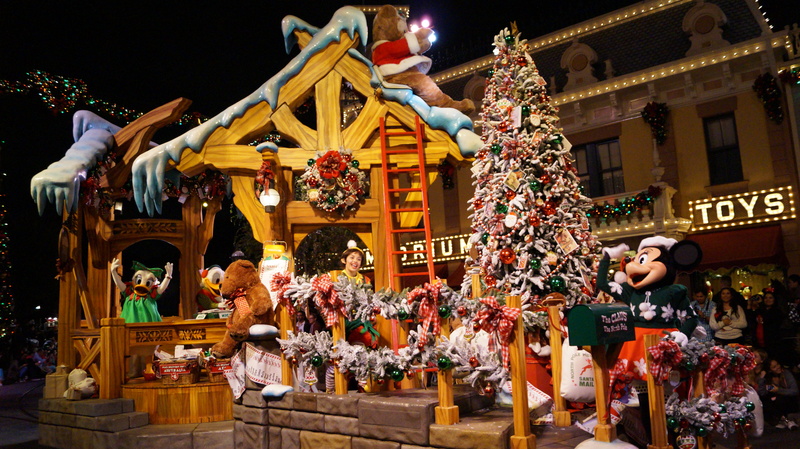 Posted on December 16, 2014, in Disneyland and tagged Christmas, DCA, Decorations, Disney Atmosphere, Disney California Adventure, Disney Christmas, DL, DL Holidays, DLR, Holiday, Holidays. Bookmark the permalink. 1 Comment. Just looking at your pictures is making me so excited about our trip next month! Great tips!